Kenpo has also been used as a modern term: a name for multiple martial arts that developed in Hawaii due to cross-cultural exchange between practitioners of Okinawan martial arts, Chinese martial arts, Filipino martial arts, Japanese martial arts and multiple additional influences. In the United States, kenpo is often referred to as Kenpo Karate. The most widespread styles have their origin in the teachings of James Mitose and William Kwai Sun Chow. Mitose spent most of his early years training in Japan learning his family style, Kosho-Ryu (Old pine tree school). James Mitose would later bring that style to Hawaii where he would teach Chow, who would go on to instruct Ed Parker and Bobby Lowe. The system of kenpo taught by Mitose employed hard linear strikes and kicks, pressure point manipulation, circular movement patterns, and joint locking and breaking. Parker is the most prominent name in the Mitose lineage. A student of Chow in Hawaii for nearly six years, Parker moved to the US mainland to attend Brigham Young University. In 1957, he began teaching the kenpo that he had learned from Chow, and throughout his life modified and refined the art until it became Ed Parker's American Kenpo. It employs a blend of circular movements and hard linear movements. Parker created techniques with names such as Thundering Hammers, Five Swords, Prance Of The Tiger, and Flashing Mace to provide a memorisation tool to the student. These arts have spread around the world through multiple lineages, not all of which agree on a common historical narrative. Orange Belt DVD is awesome! Hi everyone. My name is Tony and I live in West Palm Beach Florida, the so-called Sunshine State. Before I joined the Navy, back in 1982, my father introduced me to Kempo Karate. I only studied the form for about 2 months and then went off to the Navy. After being discharged, many life events took place. It wasn't until 2011 that I took up P90X, an extreme exercise workout program. One of the instructional videos had a Kenpo Cardio routine. It was through that workout video that I made a decision to find out about the form. Through disappointment after disappointment of searching for a kenpo karate school, I stumbled upon www.kenpoconnection.com I started to corresponded with someone on November 11, 2014 and made the move to purchase the Kenpo Self-Defense DVD on 5/09/2015 and received the DVD on the 16th.....well worth the wait. From that point on I have highly enjoyed my Kenpo ride. Sifu Herb is an excellent teacher. The 2 set DVD's are very professional and the quality of the videos are picture perfect. I have emailed Sifu Herb all the time while I was training (in my living room) to ask questions and write him about the progress I was making. He always answered me back and encouraged me and told me what a great job I was doing. The best thing about the DVD set, is that, they are step by step in depth instructional videos that you probably will not find anywhere else. Case in point. Sifu takes the time not only to show how a certain defense move is to be done, but then he takes the time to demonstrate the move from other angles. For those you are seeking to get serious in some type of self defense technique, please do not look any further...... Kenpo connection IS for the serious SEEKER to learn, practice and apply the kenpo form in one's daily life. I haven't had but 1 karate teacher in the past, but I will take Sifu Herb as my teacher over anyone else that is out there. 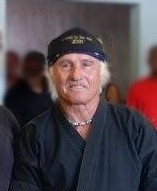 Even though, I am a few 1000 miles away, He is my kenpo teacher. On a more serious note.... Thank you for all that you have done for me Sifu Herb. Not only have you taught me how to defend myself through the Kenpo system, but you have taught me discipline and the correct way to utilize all that I have learned. You sir, are a true genuine friend and follower of Jesus Christ.